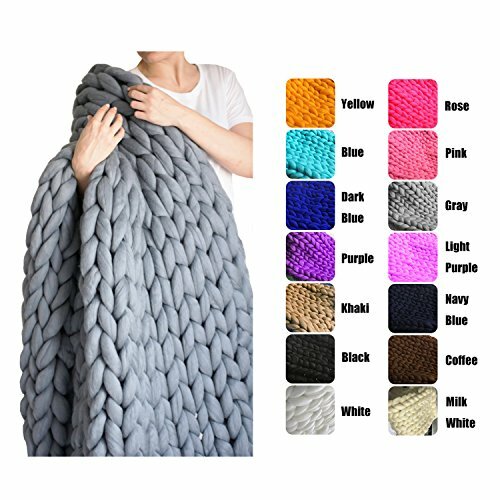 If you are looking for a great interior product, perfect gift to someone special or endless coziness, then EASTSURE chunky knit blanket is just right there for you! 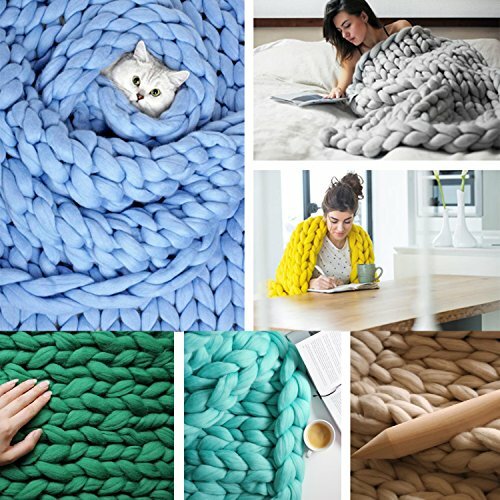 Blanket is arm knitted from giant chunky wool blend which is very warm and soft. I use only the best luxury quality wool blend which makes each product so special. 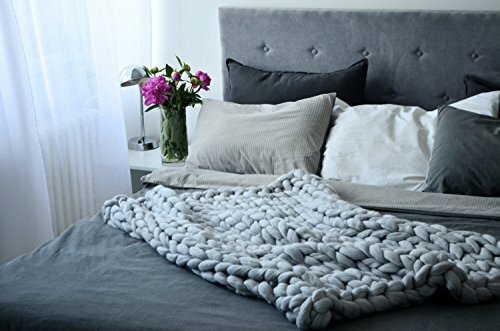 This blanket affects the joints and actively stimulates blood circulation.it also has healing properties.Throws made from wool produce micro-massage of the body,which improves blood circulation. Secondly,it's breathable and temperature regulating,perfectly maintains a constant body temperature,without overheating.It has active fiber's which mean it reacts to change in body temperature,both this and it's breathability mean thatit isn't clammy when going indoors from outside,not only that but it helps to regulate the heart rate which also improves sleep. 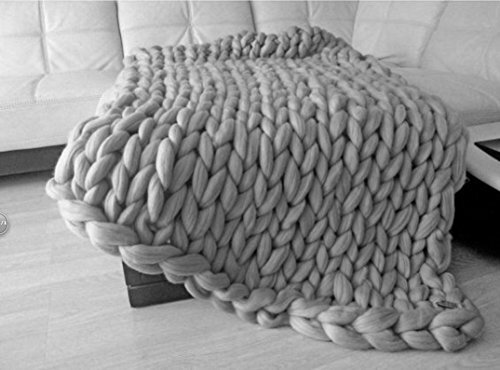 Once you get to know the chunky blanket, you will fall in love with it! It's better to use dry clean only in order to save lightness and tenderness of your blankets and scarves. Do not use machine wash and do not iron. Avoid spilling different liquids (especially intensely coloured like coffee or red wine) on your scarves and blankets. Keep in mind that this is gentle product. At first it can shed little bit. This blanket will be your best friend on the cold evenings. You will be amazed by its look and softness. If you have any questions or you would like to have a customized order, please contact me & I will be very happy to help you! 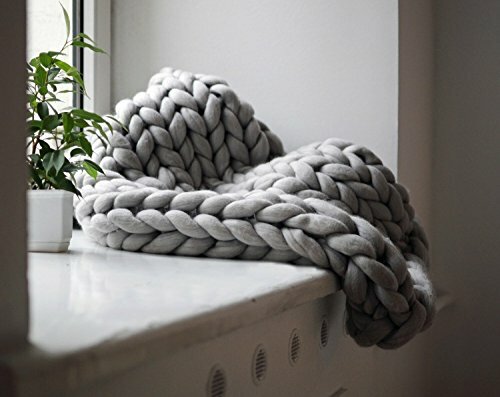 1.SHEEP WOOL Blend: EASTSURE Gorgeous Chunky Throw is made from sheep wool which is one of the finest and softest in the world. 2.SOFT and GENTLE: It doesn't itch or irritate your skin, on the contrary it feels incredibly soft and gentle to the touch. 3.SAFE: The wool yarn is hypoallergenic and antibacterial, a wonderful fiber to use around babies with their sensitive skin,as well as pregnant women and all those who care about their health and comfort. 4.BREATHABLE AND TEMPERATURE REGULATING: It has active fiber's which mean it reacts to change in body temperature,both this and it's breathability mean thatit isn't clammy when going indoors from outside,not only that but it helps to regulate the heart rate which also improves sleep. 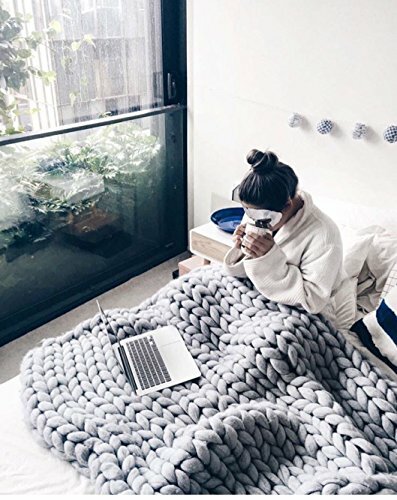 5.MULTI-FUNCTION USE: This beautiful blanket will be a great gift for you or your loved one: Birthday, Anniversary, Bridal shower, Wedding or Housewarming party.